When two unbeaten teams squad off, the end result is usually a joyous finish for one side and abject disappointment for the other. 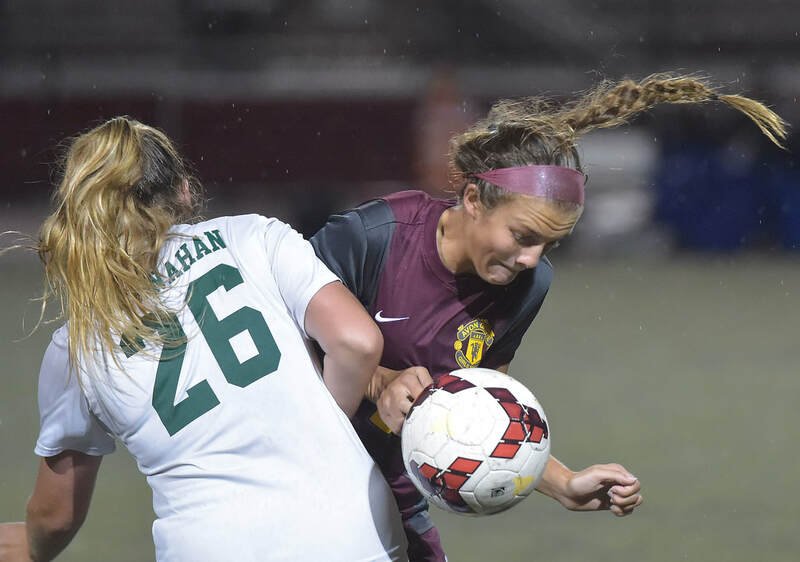 But on Monday evening, in an important midseason Ches-Mont girls’ soccer clash between Bishop Shanahan and host Avon Grove, both sides walked away with the satisfaction of avoiding a notch in the loss column. The Eagles and Red Devils are still up at the top of the league standings after a 1-1 draw which couldn’t be decided despite 80 minutes of action in regulation and two 10-minute overtimes. The Eagles – sitting atop the latest District 1 3A power rankings – are now 5-0-1 in the Ches-Mont (7-0-2 overall). The Devils (3-0-2, 5-0-3) are 22nd in the current District 1 4A rankings. It didn’t take long to see that this was going to be a grueling physical battle, which was played mostly in the rain. “They are also undefeated, so we knew that this was going to be pretty intense,” said Shanahan senior Evy Bruggeman. Scoreless at the half, Bruggeman opened the scoring about eight minutes into the second half when a deflected ball bounced right to her as she was all alone and she was able to beat Devils’ keeper Megan Kristman before she could get to the far post. It came on the heels of a dominant stretch for the Eagles just after the intermission. But about six minutes later, Avon Grove scored the equalizer when junior Jamie Perkins scored on a free kick from about 30 yards out. She caught the Shanahan defense napping with a quick restart. “We tell our kids that if it’s open, play it early. I was just so happy for Jamie. She has been working specifically on her free kicks,” Herman said. It was a tactic that the Eagles actually prepared for, but were still caught plat-footed. Neither team scored the final 26:59 of regulation, or in the first overtime. In the second OT, Perkins had a scoring chance from a bad angle at the 8:23 mark, but Shanahan goalie Jess Gorr was there. Both sides had some bad luck as well. The Devils had a prime scoring chance midway through the opening half, when a shot by Annika Francke hit off the crossbar and rebounded to teammate Grace Puffenberger, but her blast was stop by Gorr. There was also a seemingly innocuous sequence when Gorr grabbed a loose ball off a corner kick. And even though she appeared to be standing on or behind the goal line at the time, play continued despite protests by Avon Grove. And by the time is was over, the Eagles had lost three starters to injuries: leading scorer Mary Byerly, defender Julianna DelSantro, and lastly a gruesome right arm injury to Hannah Wills in the late going. The extent of the injuries is unknown but Shanahan has some time to recover before back-to-back road trips to Ches-Mont contenders Unionville and Downingtown East on Oct. 9th and 11th, respectively. “This tie is definitely not a letdown,” Bruggeman said.